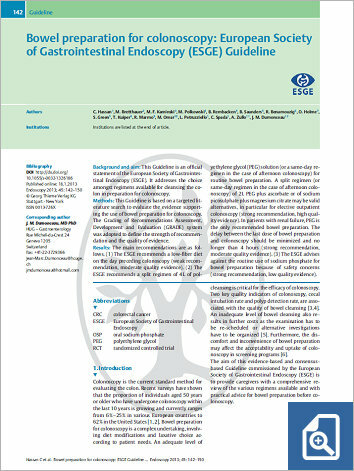 Background and aim: This Guideline is an official statement of the European Society of Gastrointestinal Endoscopy (ESGE). It addresses the choice amongst regimens available for cleansing the colon in preparation for colonoscopy. Methods: This Guideline is based on a targeted literature search to evaluate the evidence supporting the use of bowel preparation for colonoscopy. The Grading of Recommendations Assessment, Development and Evaluation (GRADE) system was adopted to define the strength of recommendation and the quality of evidence. Results: The main recommendations are as follows. (1) The ESGE recommends a low-fiber diet on the day preceding colonoscopy (weak recommendation, moderate quality evidence). (2) The ESGE recommends a split regimen of 4L of polyethylene glycol (PEG) solution (or a same-day regimen in the case of afternoon colonoscopy) for routine bowel preparation. A split regimen (or same-day regimen in the case of afternoon colonoscopy) of 2L PEG plus ascorbate or of sodium picosulphate plus magnesium citrate may be valid alternatives, in particular for elective outpatient colonoscopy (strong recommendation, high quality evidence). In patients with renal failure, PEG is the only recommended bowel preparation. The delay between the last dose of bowel preparation and colonoscopy should be minimized and no longer than 4 hours (strong recommendation, moderate quality evidence). (3) The ESGE advises against the routine use of sodium phosphate for bowel preparation because of safety concerns (strong recommendation, low quality evidence).